Ah, to have the imagination of a child again.. Remember the days of times past when you could run outside and the woods were your castle, and you had to fight off the mighty dragons. What about the fairy houses you imagined and the tiny villages you helped make for them. I read a lot as a child and loved to use my imagination. I think some of the electronics today are stealing the imaginations of children and they need to fall back into the magic of being young. 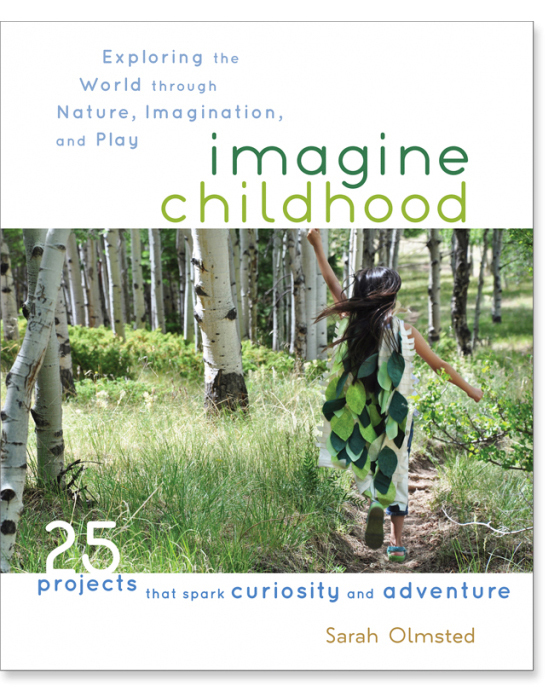 Sarah Olmsted knows what it means to imagine childhood and has written an outstanding book Imagine Childhood to explore with your children. Her and her family share their memories and remembrances as she writes and shares craft and outdoor activities to spark our desire to make magic for our own kids. 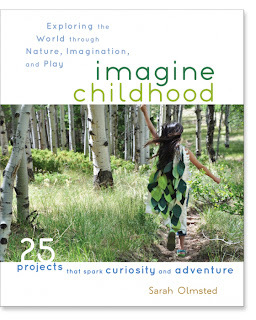 The book has 25 projects from making a seasonal cape, an earthen house, a magic wand, play tents, magic lanterns and more. In nature we take to the outdoors and utilize the seasons and nature to drive our playfulness. Birds, Leaves, Ice Storms are all natural things that can get our imaginations going and become creative. The imagination chapter has us making forts and tents, marionettes and play stages, map making. Going on journeys far off and creating a imaginary place and time to explore. You don't need a large yard to dream and play, you can use what ever section of earth you have. The chapter on play gets a little more hands on with making instruments, Rube Goldberg experiments, making bows and arrows and bowling, all with creative tools you have on hand. I loved this book! It isn't just a list of projects to do, it is so much more than that. Each chapter has insight and poetic verse to pull you back into the land of imagination. You will desire to get outside and live once you start reading this book! We can all be children again. This is such a cute idea! We all have probably said "where did they come up with that" speaking of a child's imagination. Oh, to dream and believe as a kid again! How fun to try to see things though their eyes and be playful.